I’m going to keep it short and sweet today because guys, I gotta be honest, life is busy right now! Lots of 30th birthdays this month (including Brian’s, don’t tell him I told you), work, traveling, Netflixing (currently, The OA…omg it’s crazy) and of course…St. Patrick’s Day. I’m actually going to my friend Kathryn’s 30th birthday party instead of celebrating St. Patty’s this year, but trust me when I say there won’t be any less alcohol involved. It’s basically a requirement of living in Chicago that you celebrate this day with the Irish beverage of your choice, which is pretty funny considering that when we visited Dublin last month, we heard a lot of complaints about American tourists coming to Ireland for St. Patrick’s Day just to get sloshed. Apparently they don’t celebrate it the same way we do, but maybe it’s because they celebrate that way year round. Being in Dublin wasn’t all that different from being in an average Irish bar in Chicago – same decor, same drinks, same food – except for the live music. That was pretty spectacular. 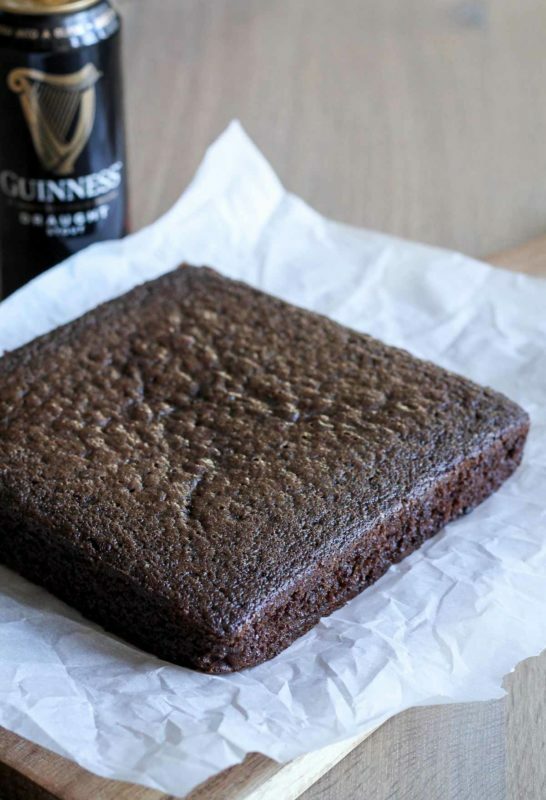 Anyway, even though I’m not celebrating traditionally this year, I created a recipe that lets us all indulge together, using not one, but TWO Irish adult beverages: Guinness and Bailey’s (or Carolan’s, the one they sell at Trader Joe’s). The flavors go really well together, though mixing the two beverages on their own isn’t a great idea (as anyone who’s had an Irish car bomb in their life can attest). 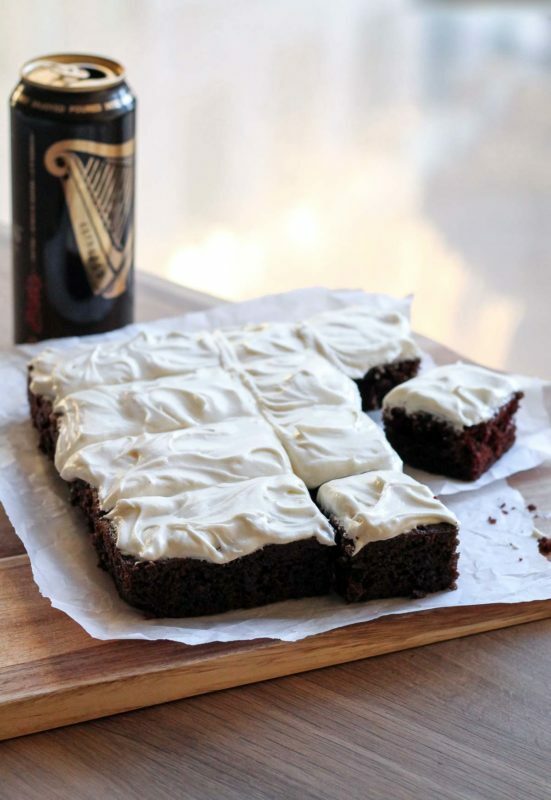 Thus, I separated them, putting Guinness in the cake and Bailey’s in the [cream cheese] frosting. The results are, in my opinion, fairly noteworthy. Don’t you love those swirls of frosting? It’s actually really easy to do. Just spread a thick layer of frosting on the cake, then run a flat offset spatula (I used this one) in a swirling pattern over and over again through the frosting until it develops a pattern you like. Make sure the frosting layer is thick (the recipe below should give you enough for this one layer) otherwise you’ll cut into the cake by accident when you’re swirling. 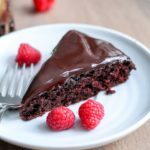 I adapted this recipe from my Single Layer Chocolate Cake with Chocolate Ganache, which has surprisingly been a breakout favorite with you all. Maybe I’ll start a single layer cake series? 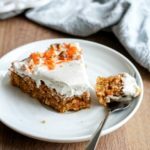 I feel like we all need more excuses to eat cake in our daily lives, and it feels less guilty when you’re eating a single layer, especially with only two people in the house. 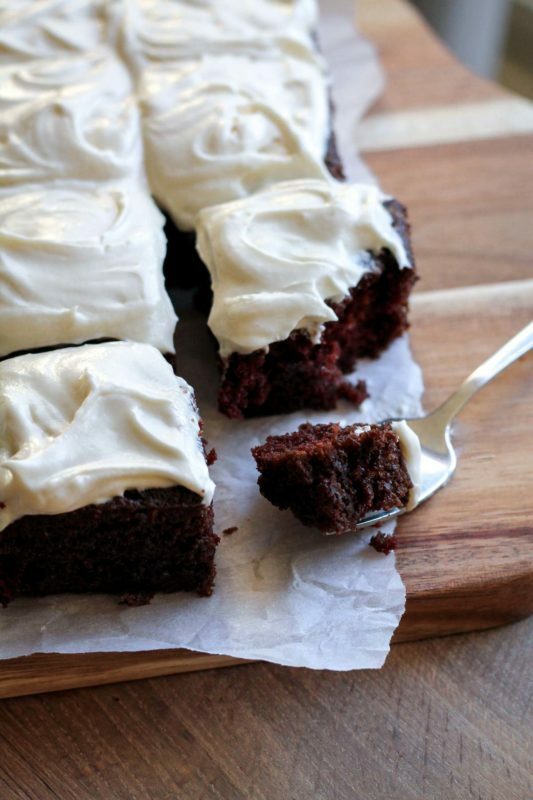 Plus, this cake is still egg-free and butter-free (although the frosting isn’t), so it still feels semi-healthy. 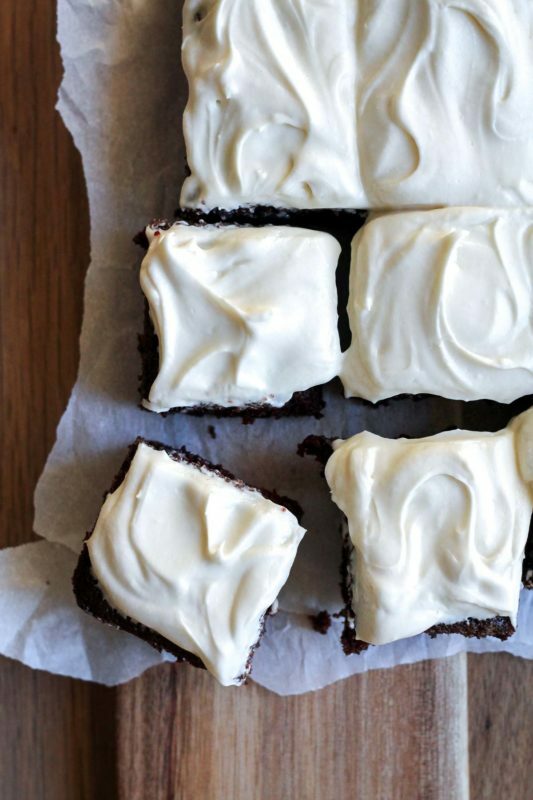 There are many recipes for Guinness cake out there, and very few are this virtuous yet this delicious. At least that’s my rationalization. 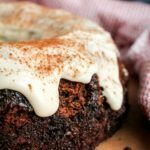 What I love about this cake is it still comes together super fast in one bowl, and you can make the frosting while the cake is baking and have this on the table in an hour tops. Less time baking = more time celebrating. 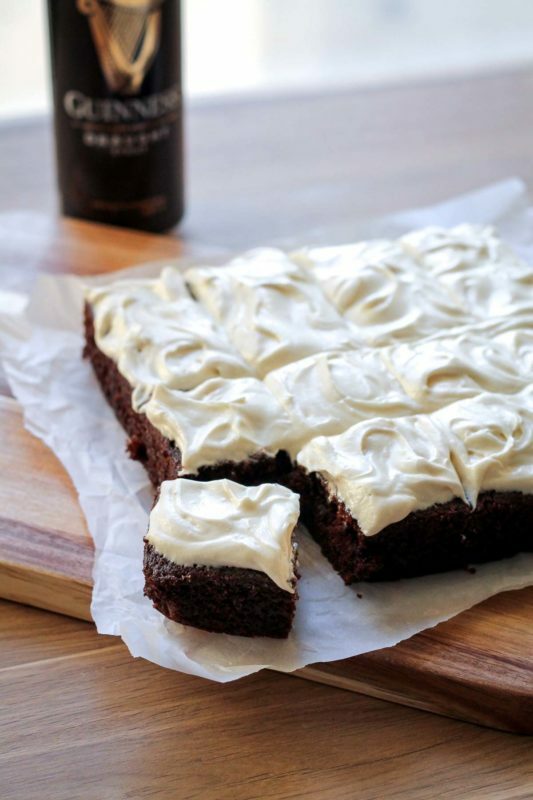 Despite this quick timeline, the Guinness flavor really comes through in the cake, and the Irish cream in the cream cheese frosting is a great creamy contrast to the deep stout chocolate. I hope you try it and love it. Happy St. Patrick’s Day! 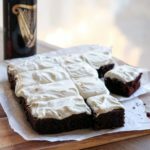 This flavorful single layer, egg-free Guinness cake with Irish cream frosting comes together in under an hour, perfect for St. Patrick's Day celebrations! Preheat your oven to 350 degrees F. Grease an 8-inch square pan. I also like to line the bottom of the pan with parchment paper, to give extra insurance that the cake will come out cleanly. Just trace the bottom of the pan on a sheet of parchment paper and cut it out, then place inside the pan. In a large bowl, whisk together dry ingredients: flour, cocoa powder, sugar, salt, espresso powder, and baking soda. Pour in the wet ingredients: Guinness, olive oil, vanilla, vinegar. Whisk it all together until a smooth batter is formed. You'll notice it might get a little foamy - that's the baking soda/vinegar reaction happening. Stop whisking when the mixture is combined and no lumps remain - don't overmix or the cake will be tough. Pour batter into prepared pan, and bake for 32-35 minutes, until cake springs back when touched and a tester inserted in the center comes out clean. 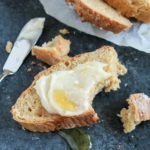 In a large bowl using a stand mixer with the whisk attachment, or a hand mixer, beat cream cheese and butter at high speed until pale and very fluffy - this should take 2-3 minutes. You want to incorporate as much air as possible into the mixture to make it light and fluffy. Add the powdered sugar, Irish cream, and salt, and beat at medium to high speed until fully combined and light. 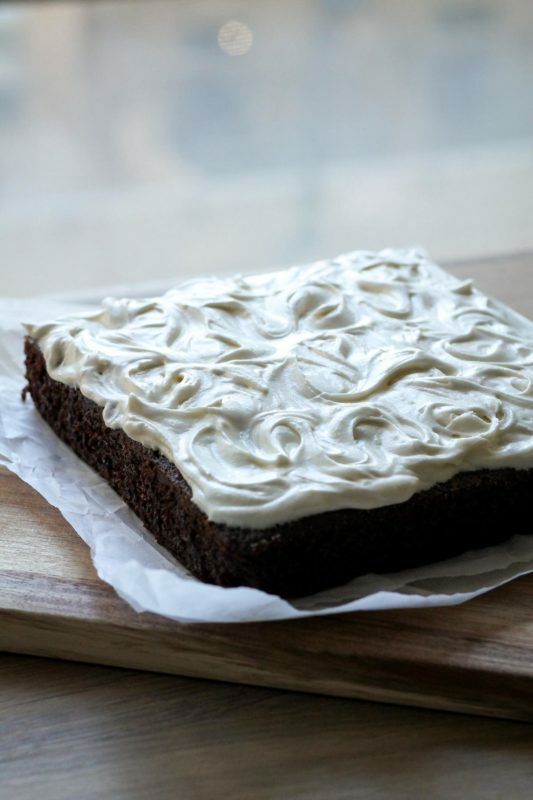 Spread cooled cake with Irish cream frosting. It should make a thick layer, and can be swirled in pretty patterns with an offset spatula (I like this one). Serve! Cake will keep, well-wrapped in the fridge, for up to 4 days. Recipe adapted from my single layer chocolate cake with chocolate ganache.